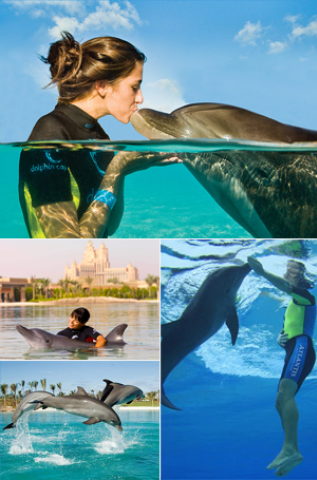 comment Perfect for children and all swimming abilities; Free Admission to Aquaventure also included! 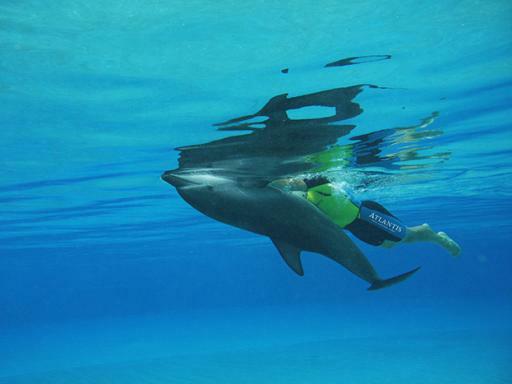 comment A one-of-a-kind dolphin experience awaits at Dolphin Bay. Journey into the depths of a lagoon alongside beautiful dolphins and enjoy the thrill of the signature belly-ride back to the shore! Great once in a lifetime experience, my wife loved it as a birthday gift. Could have been slightly longer but hey ho! Still not a bad package which includes waterpark access and private beach. 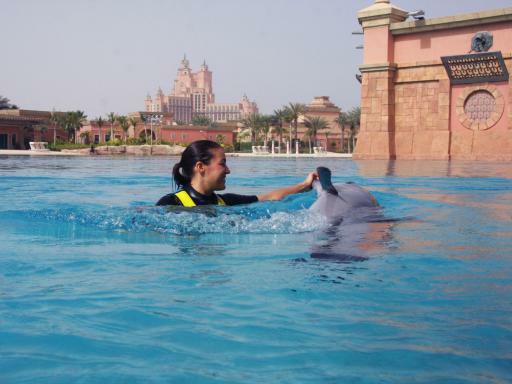 The incredible resort destination of Atlantis, The Palm holds countless secrets for a visitor to discover but no corner of the resort holds quite the same fascination as the gentle residents at Dolphin Bay. Here there are three vast lagoons where you can meet and play with beautiful Indo-Pacific Bottlenose Dolphins during a shallow water or deep water interaction. 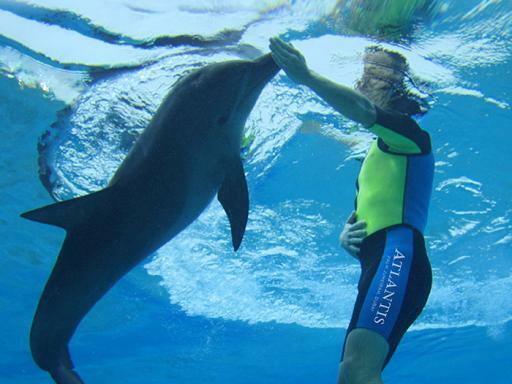 Accompanied by a qualified marine mammal specialist, enjoy an up-close experience as you touch, hug and even kiss these charismatic and graceful creatures. 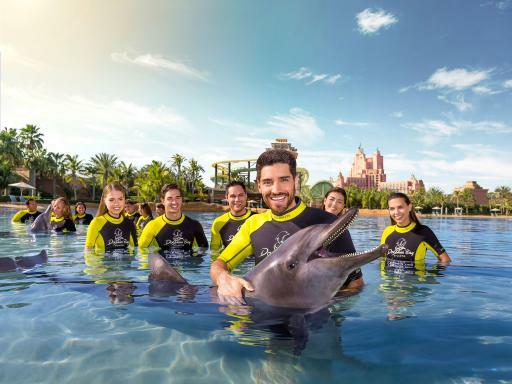 As an added bonus every interaction includes complimentary same day access to the legendary Aquaventure waterpark and pristine beach with panoramic views of Dubai’s stunning skyline. 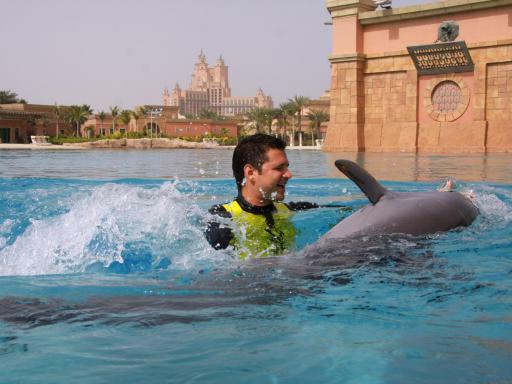 Dolphin Encounter Shallow Water Interaction: Wade into waist high water for a magical dolphin encounter which includes the chance to kiss, hug, touch, pet, dance and play with one of the beautiful dolphins and watch some high energy behaviours. 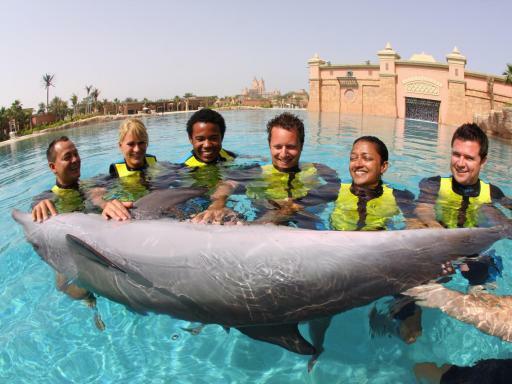 Groups are limited to just 10 guests per dolphin. 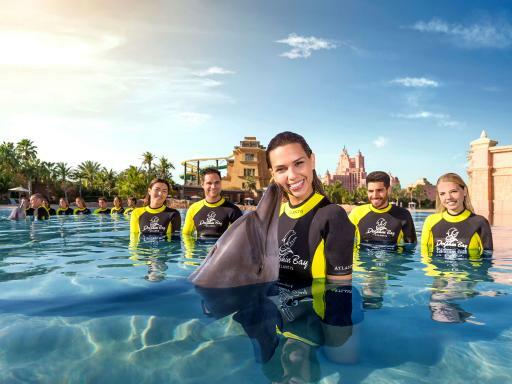 Dolphin Adventure Deep Water Interaction: Join the dolphins in the deeper waters of the beautiful lagoons for an intimate experience. 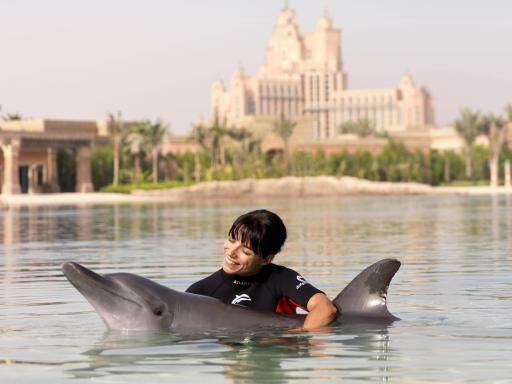 The signature belly-ride delivers you back to shore, guaranteeing you the most memorable ride of your life as your dolphin shows off his speed and agility. 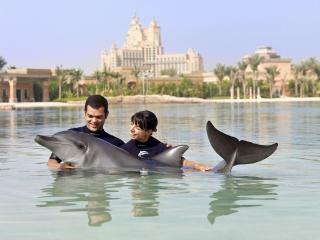 This programme is designed for confident swimmers who want to enjoy the thrill of swimming with these amazing animals. Groups are limited to just 6 persons per dolphin. 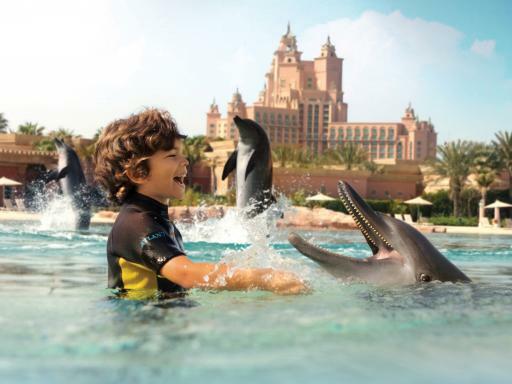 Children under the age of 12 must be accompanied by an adult over the age of 18 who is also participating in the Dolphin interaction. The maximum permissible ratio of adults to children is one adult to three children under the age of 12 years of age. 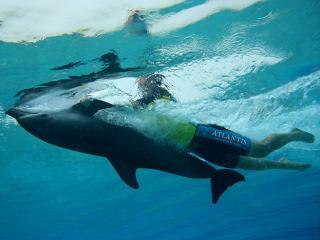 There is a minimum age requirement of 8 years for the Dolphin Adventure programme. Dolphin bay is part of Kerzener Marine Foundation and also serves as the first marine resource and rehabilitation centre in Dubai. Spectators are welcome, but they must purchase an Observer Pass must be purchased locally. 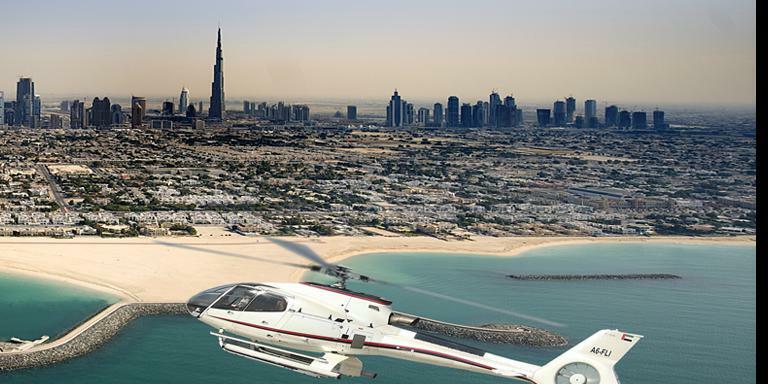 The current cost is AED300. The whole experience at Dolphin Bay was amazing. Never thought as a family we would be swimming with dolphins in Dubai! Package was great but I think that people paying for the expensive package should get better photo opportunities. People with the cheaper package had better picture opportunities.